Oh, happy day! 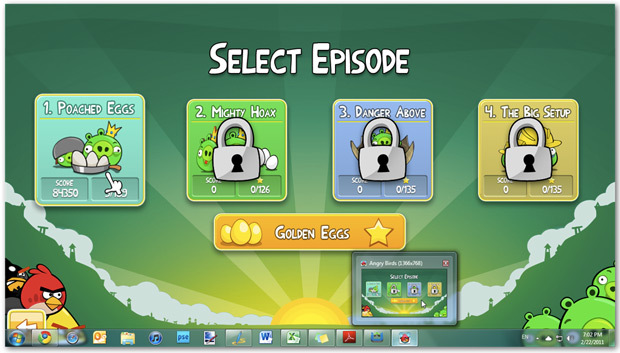 Angry Birds is now available for the PC. “But wait,” you say. “There’s no app store on Windows. How will I download it?” Don’t worry: Intel has you covered. The game, which costs $4.99, is available on the Intel AppUp store. The Intel AppUp store—silly name aside—is just that: an “app store” for Windows PCs. The game is the Angry Birds you all know and love, but you can’t import any of your scores from the mobile version of the game into the desktop version. Angry Birds on your phone, Angry Birds on your desktop. All hail Angry Birds!